The In-Line port design of these Splitter helps to keep cables organized and makes them perfect for installations in crowded areas. Nickel plated zinc die cast construction. Bandwidth: 5-1000MHz. Three (3) Output Ports; Two (2) are -7.5 dB loss and the Third is -3.7 dB Loss. 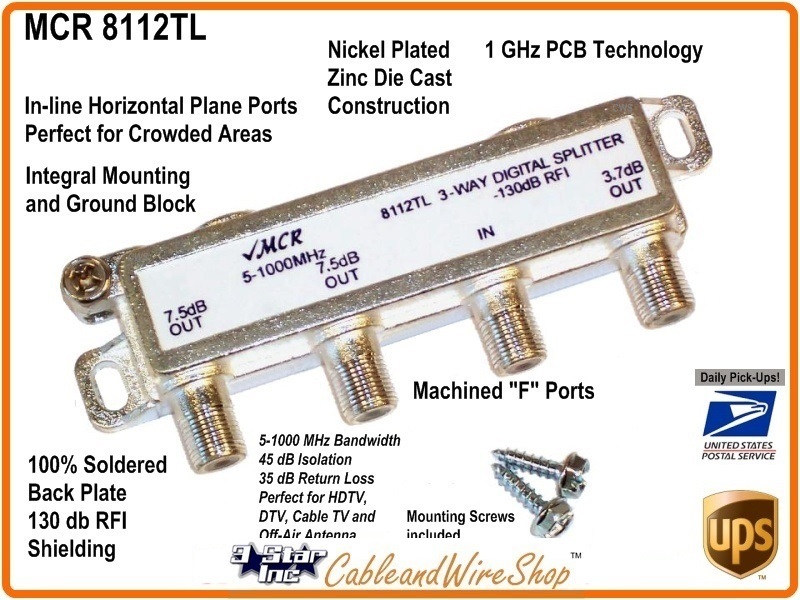 Note: This is a Unique concept in Cable TV Antenna Splitter Housings that some Cable TV Companies use for home exterior Drop Installation. Its Plated Housing is Soldered Closed and Sealed from the Environment and all the F Port cable connections are Horizontal in the same direction. Installed with the Ports facing down, Gravity naturally drains water accumulated form Humidity and Rain away from the Port Connections; thereby reducing Corrosion and water migration. The Finish is designed to Resist Corrosion due to Weather. It will pass 1 GigaHertz worth of Forward and Return signals; making it perfect for Splitting Cable TV with High-Speed Internet and Pay per View DVR Box Connection Signals. The Voltage Protection also makes it suitable for splitting HD TV Antenna Signals as well. When making RG6 or RG11 cable connections outside, a weather boot covering and some sort of Silicone compound are highly recommended.